Luxbet is a subsidiary to TabCorp Holdings, a listed company on the ASX100, and was initially launched in September of 2008. It is a sister company to TAB Sportsbet. It is originally an Australian bookmaker, but now it also operates in Europe and is licenced and regulated by The Isle of Man Gambling Supervision Commission. The site is restricted in the USA, Denmark, Belgium and China and only operates in English despite access to markets across Europe. If the bookmaker is to expand it should seriously consider catering for the potential non-English speaking players. With a heavy focus on racing and sports popular in Australia, Luxbet also cater well for the European market. There is no Casino, Live Games or Poker room available, with all of the bookmaker’s efforts being dedicated to its sportsbook. Luxbet is an approved betting operator for the AFL, NRL, Cricket Australia, Tennis Australia and the PGA of Australia. They also are sponsors of the Luxbet All Weather Racing Club in Devonport, Australia. Recently they signed a three-year sponsorship deal with Tasracing, the governing body for horse racing in Tasmania. Excitingly, they are investing in the growing E-Sports market, sponsoring Unikrn, an all female Counter Strike: Global Order team. There are also endorsed by Sir Rupert Clarke, the Australian celebrity who has been a soldier, businessman and jockey. Luxbet maintain a good social media presence with over 12,000 followers on Twitter, which is updated almost daily with exciting wagers, videos and promotions. With almost 50 different markets, 150 different betting options for most matches in the NRL and AFL, Luxbet offer a huge range of choices for Australian players. There is also a huge range of options for other sports with an incredible focus on its racebook. Greyhound Racing, Harness Racing, Horse Racing, Jockeys Challenge, Feature Racing, American Football, Aussie Rules, Baseball, Basketball, Boxing, Chess, Cricket, Cycling, Darts, Esports, Elections, Featured Events, Golf, Handball, Ice Hockey, Live Betting, Martial Arts, Motorsports, Rugby League, Rugby Union, Snooker, Football, Special Events, Surfing, Tennis, Volleyball, Winter Sports. They have an impressive esports market compared to other bookmakers, offering good markets for Counter Strike, League of Legends and DOTA2. As a result of Australia’s interactive Gambling Act, this facility is not available in Australia, and players must phone in to place live bets. 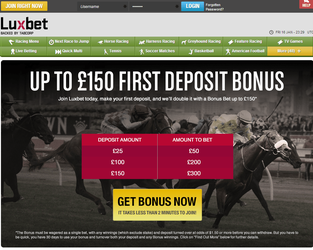 For their European market, Luxbet offer an incredibly limited service. There is currently no live streaming facility or option for cash out. Although understandable in the Australian and racing context, in Europe live betting has become increasingly lucrative over the past few years and it is imperative if any bookmaker is to successfully compete. The site is very smoothly designed and simple to navigate for even the newest of players. In part this is due to their dedicated sportsbook, which is not cluttered with other facilities. The odds display is a pleasure to work with and arguably one of the best services available in terms of its simplicity. The mobile app is also well designed, especially after changes made in recent years, and is a reliable choice. The site have a live chat facility as well as email and telephone support available. The staff are more than happy to help, available 24 hours a day and any issues will be dealt with quickly and efficiently. One major drawback of the bookmaker is the lack of payment options with withdrawals only available via bank transfer and deposits limited to a few options. Much more could be added to improve what is otherwise a great service. In terms of bonuses and promotions there is a great welcome offer $150AUD bonus on a $50 deposit if you enter the Promo Code MAXCASH. There is also the Promo Code MAXIMUMBONUS, which allows players to access up to $700AUD worth of promotions. These promotions are not found on Luxbet’s site. Luxbet offer a great service, dedicating their site solely to the sportsbook and allowing them to cater for specific players. However, as the bookmaker is focused on the Australian market it means their European arm is struggling to offer what other competitors do, and much more work needs to be given especially to the live betting facility if they are to be successful. – Big free bet offer for new punters. – Website isn’t as easy to navigate as some sites.